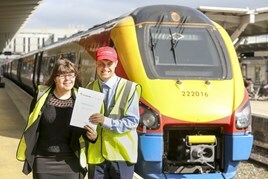 East Midlands Trains (EMT) launched a four-week work experience programme in Derby on September 7. Its new Train into Work programme is intended to aid local regeneration on the North Staffordshire Line, by providing young people and long-term unemployed with 20 days’ work experience in customer service with EMT, and to help with future searches for work. The initiative was developed with North Staffordshire Community Rail Partnership, the Institution of Railway Operators (IRO), Alsager Job Club, and the Moorland Learning Disabilities Team at Staffordshire County Council. If successful, the programme will be rolled out to other routes on the EMT network.